1924 Animator Walt Disney, for Laugh-O-Gram Films, directed his first cartoon, the 12-minute short Alice's Wonderland (aka Alice in Slumberland) (1923) - it was Disney's first unfinished pilot film. The combination live-action and animation was never released theatrically, however, due to legal complications. The Alice comedies of the mid-20s, as they were later known, were a major stepping stone in Disney's career. Fifty-six Alice comedies were produced between 1924 and 1927 (10 in 1924, 15 in 1925, 14 in 1926, and 17 in 1927). The first Alice comedy short to officially be released, produced at Disney's studio (in a garage in Hollywood), was Alice's Day at Sea (1924), on March 1, 1924. 1924 Actor-turned-director Erich von Stroheim directed the influential Greed (1924), his fifth and most ambitious film to date. It was based on Frank Norris' best-selling novel McTeague about a love triangle and disputed ownership of a lottery ticket. After filming ended (including expensive on-location shoots in San Francisco and Death Valley), it was a 9 to 10-hour epic. The movie was eventually brutally edited down from 42 reels into an approximately 2-hour length before its theatrical release. It was reported that the studio melted down the excised footage to recover the film stock's silver nitrate. The cuts were demanded by MGM that wanted the film to be of acceptable, commercial length - an early example of directorial vs. studio conflict. The final cut was disavowed by the director, who insisted on a two-part 4 and a half hour film. The original print of the film has been lost forever, although there have been repeated rumors of its existence. A restored, four-hour version was recently reconstructed in 1999 by Turner Classic Movies and film archivist Rick Schmidlin - using the continuity script, he pieced together existing footage and 650 stills and placeholders, to create a fuller sense of Stroheim's original film (with its numerous subplots and complexities). 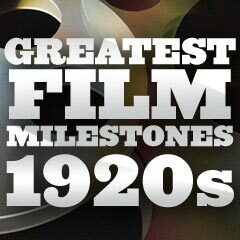 1924 Theaters showed the first double features. 1924 The future MGM studio was formed out of the merger of three US film production companies: Marcus Loew's Metro Pictures Corporation (1916), Goldwyn Pictures Corporation (1917) (known as Metro-Goldwyn), and the independent Louis B. Mayer Pictures Company (1918). MGM was destined to become the dominant studio of Hollywood's Golden Age during the 30s, under Louis B. Mayer's direction. 1924 The first film produced by the newly-formed studio MGM was He Who Gets Slapped (1924), starring Lon Chaney, although it wasn't their first released film - its release was postponed until the end-of-year holiday season to bring in more profits with increased audiences. He Who Gets Slapped also featured the first appearance of the MGM lion (a lion named Slats). The famous MGM lion roar (from a lion named Jackie) in the studio's opening logo, however, was first recorded and viewed in White Shadows of the South Seas (1928) - via a Gramophone record. 1924 The silent, propagandistic, Soviet sci-fi epic Aelita (1924) (aka Aelita: Queen of Mars), at 120 minutes, was both the first big-budget film made in Russia, and the first feature-length science-fiction film (about space travel). Other early sci-fi silent films included Fritz Lang's Metropolis (1927) and Woman in the Moon (1929), and Britain's futuristic High Treason (1929). 1924 F.W. Murnau's The Last Laugh, with revolutionary camera work by the celebrated German cinematographer Karl Freund, virtually invented a host of new techniques for a mobile camera ("unchained camera"). 1924 Co-writer/director Walter Summers' silent 60-minute drama Who is the Man? (1924, UK), a "lost film," was British actor John Gielgud's debut film (as the character of Daniel) - his sole silent role. The complex, melodramatic tale of a deadly 'love triangle' was based on French writer/actor Louis Verneuil's successful theater production of Daniel. 1924 C.B.C. Film Sales Company (founded by brothers Jack and Harry Cohn, and Joseph Brandt) officially changed its name to Columbia Pictures Corporation. 1924 American stage and silver-screen actress Ethel Barrymore was the first film actress to appear on the cover of Time Magazine - for the November 10th, 1924 issue.